Me 182 cm shaped, Bruce 170 cm shaped and 182 shaped, Christy, Amy Theakston, Jacob, Scott Warren. See that little patch at the bottom? That was it. And about half of that was bunny slopes. Only two blue slopes and one of those was just a steep catwalk. One teeny black only about 100 meters long with basically no moguls. Bruce and I used up the mountain in the first day. Man, I loved my new boots. In my previous seven ski trips I only ever got boots that fit me one time. After buying ice skates and ski boots I've come to realize my feet are shaped funny. Boots that are Good Enough for other people are too loose for me. I'm unable to control my skis with rentals. 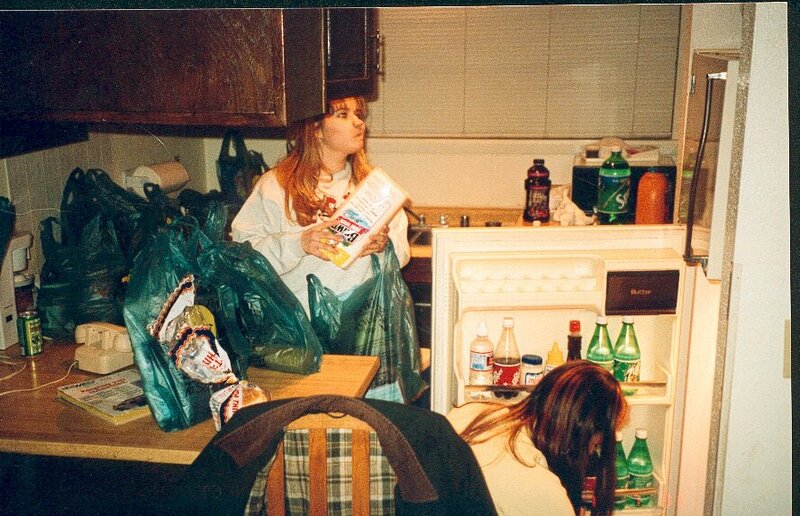 Here's Christy and Amy dealing with the load of food we bought for the week. These new boots are very comfortable. I didn't even have to loosen them for lunch. 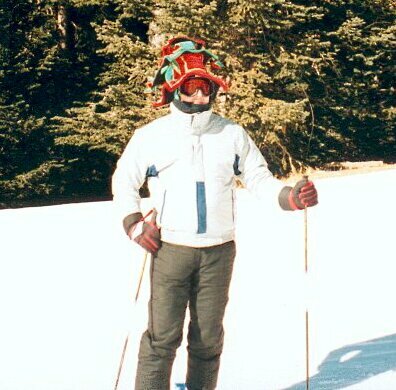 And I had great control of my skis. They were everything I wanted in ski boots. It really would have been interesting to find out if I could control them on moguls. My pagoda hat was a big success. Christy sewed some reinforced straps onto it so that it stayed in place. It only blew back when I was tucking into a stiff headwind. And it turned out to be a great opening for talking to snowbunnies on the lifts. I'd pull up next to a single and ask, "You don't mind riding up with the silly hat?" and they'd say no and ask where I got it. I had a couple of nice conversations with some very pretty girls. Interestingly, the first woman I rode up with lives just a few miles from me, here in Richardson. Another good change this trip was Scott's CB walkie talkies. Those helped immensely in cutting down waiting time. Almost every time we got split up into two groups the radios were split, too. We had a little trouble with fast people having to wait at the lifts for slow people to get down. But I think there was only once that a group went off without a radio and we spent more than ten minutes standing by a lift wondering when we'd see them. Of course, with so few runs open nobody could get lost for very long, anyway. What runs were available turned out to be a fairly good mix for the newbies for the first four days. But by the fifth day even they were getting down fast enough to get bored of the same runs over and over. With so few runs open the newbies never got a chance to learn how to read a trail map. 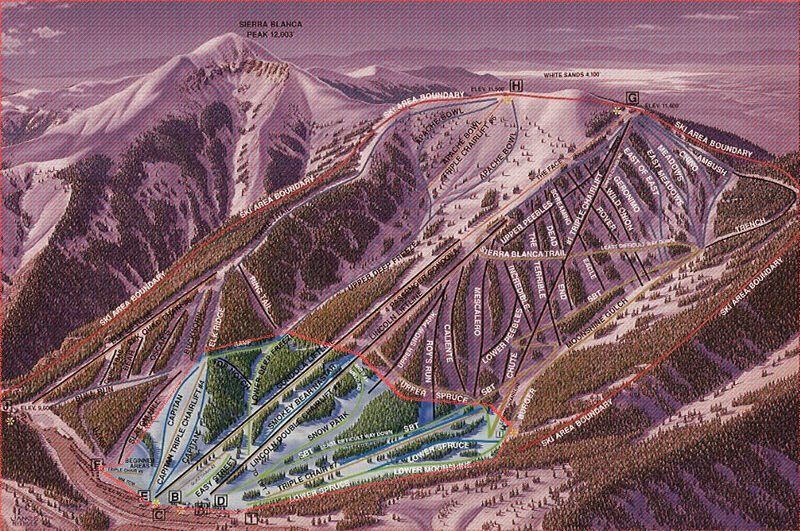 Basically, we just had three lifts, Capitan, Lincoln and #7 and each of those only had two routes down. So we'd say, "I'm going up Capitan and coming down the back side." If there were more runs open we would have had to be more specific. Their instructor on the first day seemed like a fun guy. Bruce and I got bored by the end of the first day and started tagging along with the class. Bruce wanted to annoy them, I was just hanging and listening to what Jack said. I ended up picking up a tidbit that helped later on. At the end of the second day we had our first injury. Scott was getting on the Capitan lift when some random person blew it getting on with him. I didn't see what happened, but probably the person didn't move forward far enough. He went down and got tangled in Scott's skis and twisted Scott's knee. Luckily it wasn't serious. On the third day Bruce, Scott, Jacob and I changed to snowboards. We got there 45 mins before lessons started so we took a few runs down the bunny slope to see if we thought we needed the lessons. Bruce already had 1/2 day of experience and of course he picked it right up. But he didn't remember enough of his lessons to help us much. Jacob picked it up pretty quick. Scott and I had trouble. So Bruce and Jacob went off on their own and Scott and I took lessons. When you fall on a snowboard you don't fall, you get body slammed. The first several falls rattled my teeth. I wasn't liking it. We started with eight in our class. A fat woman and her son gave up in the first half hour. 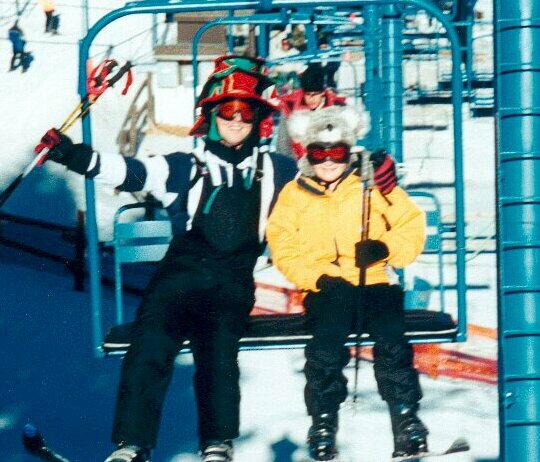 Scott ended up twisting both ankles and re-injuring his knee so he quit before lunch and switched back to skis. So by lunch we were down to five. And I was just barely hanging in there. Similar to ski boots, my rental snowboard boots didn't fit well. They weren't painful but they were too loose. My heel came up at least an inch. That meant I had to move my legs a long way to go from one edge to the other. In addition, the conditions were really tough. For most of the bunny slope the wind had blown the loose snow off of the hard-packed stuff. So if you got it just a little wrong you went down hard. After lunch, Jacob had a nasty fall. Apparently he hit head first and said it made his vision a bit blurry. That means a mild concussion. He kept going. Then near the end of the day Bruce had a painful fall. That night when Bruce and Jacob were trading back in for skis I tried on a couple of different snowboard boots. I didn't get any that felt like they'd be any better so I went back to skis, too. I may give snowboarding another chance. If the conditions were better then falls would be more forgiving. But even if I figured out how to do it, I simply prefer the speed of skiing. I don't think I'll ever be a snowboard punk. At the end of that night we went to the Inn of the Mountain Gods casino on the Indian reservation. I blew about eight bucks on various slot and poker machines. As we first entered we watched a little craps and then watched a few cute girls playing roulette. We ended up playing primarily nickle slots. I seemed to have a knack for losing my money very quickly. Jacob splurged a little and played some quarter slots. He got a few hits but mostly fed them back in and lost his winnings. Then as it seemed we were about to leave Jacob bought five rolls of nickles and handed them out. We sat down at a row of machines and had about an hour and a half of fun. Some of the group was getting pretty drunk by then, which added to the giggling. The electronic slots are a bit more complicated than the one line across mechanical slots. If you play more than one credit at a time it gives you more chances to win. It also gives you the chance of multiple hits in one spin. So it was common for someone to be down to their last 10 or 20 credits and then get a hit for 200 credits. They tended to hit the cash out button just to hear all of the coins drop out. They'd put them in a cup and pass them down the line to spread the wealth and fun. Then someone else would hit and the same thing would happen again. Bruce had the big winner at 535 credits, or about $26. In all, we had a lot of fun for that last $10. Just as we decided to leave Christy grabbed her camera to snap some pictures. Apparently that's not allowed. The security guy tried to confiscate her camera. We convinced them that we were headed out the door right then and he let her keep it. We had to wait for one machine to pay out and it ran out of coins part way through, which made the security guy unhappy. But we eventually made it. The next morning we got up early and drove out to White Sands and played around on the sand dunes for awhile. That was fun. On the fourth day newbies Scott and Christy braved the one real blue, Capitan. You could tell that about 1/3 of the way down they were thinking to themselves that they had bitten off too much. They were getting really tired. But they perservered and ended up conquering that run. Scott took one hard fall early on when I was trying to set up for a picture. He caught an edge on a tiny mogul and it twisted him around and he landed flat on his back. It looked painful. He bounced right up and we got some shots. I don't know that any turned out very good, though. Just before that he got some shots of me from the lift. That should be a pretty good angle. Christy took some more of the same the last day of Bruce, Jacob and I. On the fifth day, Amy and I ended up seperated from the rest of the group. I noticed that she was back on her heals going around turns. I remembered when Jack, their instructor, had told the class at one point to bend their knees. As I thought about that, it occurred to me why that was so important. You don't want to lean forward, because that throws you off balance, too. If you simply bend your knees your head stays above your boots. The bend puts pressure on the front of the boots and forces your heal into the heel pocket of the boot. You end up with better balance and your feet are set into the boot better giving you much more control. Everything just falls into place. Amy said that did help her a lot. After lunch I got a chance to ski with Christy. She was also a bit behind her skis, plus she was coming to a near-stop on each turn. I mentioned the knee bend again and that appeared to help her, too. Also, I suggested she complete her turns by letting her skis run and using the mountain to control her speed rather then kicking to a stop after each turn. She was really wearing herself out. After that she kept her speed up and still seemed very much in control. I think everyone would have liked to ski another day, except that there just wasn't enough variety to hold their interest. Still, the entire group now knows how to ski and all of us are looking forward to next year.